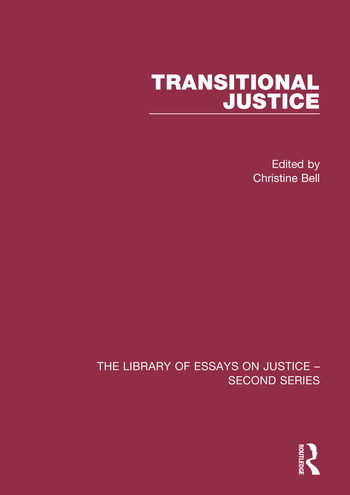 This collection on transitional justice sits as part of a library of essays on different concepts of ’justice’. Yet transitional justice appears quite different from other types of justice and fundamental ambiguities characterise the term that raise questions as to how it should sit alongside other concepts of justice. This collection attempts to capture and portray three different dimensions of the transitional justice field. Part I addresses the origins of the field which continue to bedevil it. Indeed the origins themselves are increasingly debated in what is an emergent contested historiography of the field that assists in understanding its contemporary quirks and concerns. Part II addresses and sets out parts of the ’tool-kit’ of transitional justice, which could be understood as the canonical research agenda of the field. Part III tries to convey a sense of the way in which the field is un-folding and extending to new transitions, tools, theories of justice, and self-critique. 1. How "Transitions" Reshaped Human Rights: A Conceptual History of Transitional Justice’, Human Rights Quarterly, 31, 2009, pp. 321-63. 2. Human Rights in Transition: Transitional Justice Genealogy, Harvard Human Rights Journal, 16, 2003, pp. 69-94. 3. Justice Discourses in Transition, Social & Legal Studies, 13, 2004, pp. 305-28. 4. United Nations, The Rule of Law and Transitional Justice in Conflict and Post-conflict Societies: Report of the Secretary-General, UN Doc. S/2004/616, 2004, pp. 3-24. 5. Introduction: The Global Celebration of Transitional Justice and the East Timor Reality, in The Dynamics of Transitional Justice: International Models and Local Realities in East Timor, 2012, pp. 3-21. 6. "Settling Accounts" Revisited: Reconciling Global Norms with Local Agency International Journal of Transitional Justice, 1, 2007, 10-22. 7. Concurring opinion of Judge Diego Garcia-Sayán, Judgement of the Inter-American Court of Human Rights, Case of The Massacre of El Mozote and Nearby Places v El Salvador of October 25, 2012. Part II: Transitional Justice ‘Tool-kit’ or Conception of Justice? 8. Between Impunity and Show Trials, Max Planck Yearbook of United Nations Law, 6, 2002, pp. 1-35. 10. Confronting Past Crimes: Transitional Justice and the Phenomenon of Truth Commissions, Unspeakable Truths: Transitional Justice and the Challenge of Truth Commissions, 2011, pp. 7-19. 11. Memory Frictions: Localizing the Truth and Reconciliation Commission in Sierra Leone, International Journal of Transitional Justice 1, 2007, pp. 183-207. 12. Vetting and Transitional Justice in Alexander Mayer-Riechk and Pablo de Grieff (eds), Justice as Prevention: Vetting Public Employees in Transitional Societies, 2007, pp. 523-44. 13. Reparations in the Aftermath of Repression and Mass Violence in Eric Stover and Harvey M. Weinstan (eds), My Neighbor, My Enemy: Justice and Community in the Aftermath of Mass Atrocity, 2004, pp. 121-39. 14. Gender and Collective Reparations in the Aftermath of Conflict and Political Repression in Ruth Rubio-Marín (ed), The Gender of Reparations, 2009, pp. 381-402. 15. Introduction in Mihaela Mihai and Mathias Thaler (eds), On the Uses and Abuses of Political Apologies, 2014, pp. 1-4. 16. Political Apologies and Categorical Apologies in Mihaela Mihai and Mathias Thaler (eds), On the Uses and Abuses of Political Apologies, 2014, pp. 32-51. 17. Reconciliation as Ideology and Politics, Constellations, 15, 2008, pp. 249-64. 18. Transitional Justice and Ongoing Conflict, in Chandra Lekha Sriram, Jemima Garcia-Godos, Olga Martin-Ortega and Johanna Herman (eds), Transitional Justice and Peacebuilding on the Ground: Victims and Ex-combatants, 2012, pp. 41-60. 22. Anticipating the Past: Transitional Justice and Socio-Economic Wrongs in Social and Legal Studies, 21, 2012, pp. 171-86. 23. Plunder and Pain: Should Transitional Justice Engage with Corruption and Economic Crimes? in International Journal of Transitional Justice, 2, 2008, pp. 310-30. (i) To what Political Ends? 24. Justice After the War: The International Criminal Court and Post-Gaddafi Libya in Kirsten J. Fisher and Robert Stewart (eds), Transitional Justice and the Arab Spring, 2014, pp. 188-207. 25. Transitional Justice as Global Project: Critical Reflections, Third World Quarterly, 29, 2009, 275-89. 26. The Violence of Peace: Ethnojustice in Northern Uganda, Development and Change, 45, 2014, 608-30. 27. On TJ Entrepreneurs and the Production of Victims, Journal of Human Rights Practice, 2, 2010, 208-28. 28. Impact Assessment, Not Evaluation: Defining a Limited Role for Positivism in the Study of Transitional Justice, International Journal of Transitional Justice, 2010, 4, 2010, 355-76. Christine Bell is Professor of Constitutional Law, University of Edinburgh, UK.